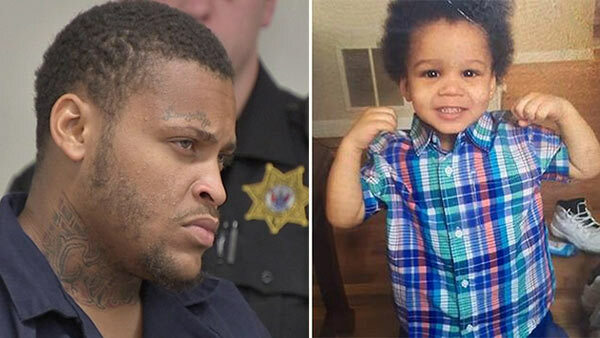 PENNSAUKEN, N.J. -- Bail has been set at $1 million for a man accused of fatally beating his girlfriend's toddler son. Zachary Tricoche, 24, was bound over for trial at his arraignment Tuesday on first-degree murder charges in the beating death of 2-year-old Jamil Baskerville, Jr. In court on Tuesday, prosecutors alleged the beating followed a fight between Tricoche and the boy's mother. He was upset, prosecutors said, because she bought the wrong groceries. Officers were called to the 5900 block of Mansion Boulevard around 11:30 p.m. Saturday for a report of an unresponsive child. Mother: "My boyfriend is like trying to get him to wake up." Dispatcher: "Can you see if his chest is rising and falling? Can you feel if he's breathing?" Mother: "He has bruises on his chest." Medics rushed the child to Cooper University Hospital, where he succumbed to his injuries shortly after 12 a.m. Sunday. Prosecutors initially did not provide details on the child's injuries or said how they may have occurred. Zachary Tricoche, 24, is charged with first-degree murder, authorities announced Monday. There was a delay by police in releasing the details about the murder because authorities were trying to find the boy's biological father and notify him of the death. Action News is told the child did have siblings.